Plumbing originated during ancient civilizations such as the Greek, Roman, Persian cities as they developed public baths and needed to provide potable water and drainage of wastes, for larger numbers of people. Standardized earthen plumbing pipes with broad flanges making use of asphalt for preventing leakages appeared in the urban settlements of the Indus Valley Civilization by as early as 2700 B.C. 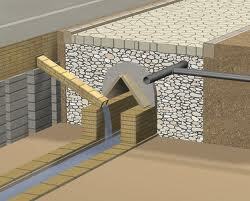 The Romans carried on developing their pipes and drainage systems; between the periods of 800-300 b.c. they had started using lead pipes. 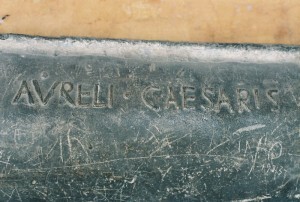 The Romans used lead pipe inscriptions to prevent water theft as you can see. The Romans also built the first aqua ducts and sewage systems as you can see the cutaway view of a typical Roman street during the Roman Empire, showing lead water pipes and a central channel for sewage under the pavement. Typical old Galvanised Iron Pipes. Improvement in plumbing systems was very slow, with virtually no progress made from the time of the Roman system of aqueducts and lead pipes. Plumbing was extremely rare until the growth of modern densely populated cities in the 1800s. During this period, public health authorities began pressing for better waste disposal systems to be installed, to prevent or control epidemics of disease. Earlier, the waste disposal system had merely consisted of collecting waste and dumping it on the ground or into a river. Eventually the development of separate, underground water and sewage systems eliminated open sewage ditches and cesspools. Most large cities today pipe solid wastes to sewage treatment plants in order to separate and partially purify the water, before emptying into streams or other bodies of water. For potable water use, galvanized iron piping was commonplace in the United States from the late 1800s until around 1960. 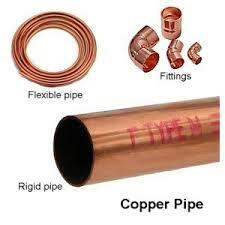 Standard Copper Pipes and Fittings. After the 1960’s that period, copper piping took over, first soft copper with flared fittings, then with rigid copper tubing utilizing soldered fittings. The use of lead for potable water declined sharply after World War II because of increased awareness of the dangers of lead poisoning. At this time, copper piping was introduced as a better and safer alternative to lead pipes. This is what your Plumber will use today.